You’ve lived with crooked teeth for years, and while you often find yourself hiding them when you smile, you also don’t like the idea of wearing bulky metal braces. What if you could straighten your teeth without anyone noticing, would you do it? Of course you would! This is the opportunity that Invisalign offers our patients and Dr. Byron McKnight can help you achieve the straight, beautiful smile you’ve always dreamed of. Here’s what you can expect from Invisalign in Mesquite. 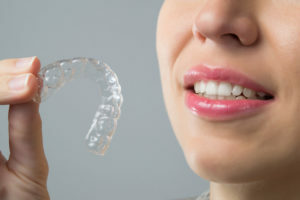 Instead of relying on metal brackets and wires, Invisalign utilizes clear plastic aligners to apply gentle pressure and straighten your teeth. Aligners need to be worn for 20-22 hours per day, however they can be removed for eating and brushing. You’ll receive a new set of aligners every two weeks, and most Invisalign cases can be completed in 12-18 months. Besides being virtually invisible, Invisalign offers a number of benefits to our patients. Aligners are snug fitting and comfortable to wear so they don’t interfere with your normal activities. Because aligners are easy to remove, you don’t have restrictions with your diet, or changes to your home care routine as you would with traditional braces. Invisalign is an efficient and comfortable treatment that delivers great results, making it ideal for busy adult patients who want to straighten their teeth with discretion. While you understand the toll that crooked teeth take on your confidence, did you know that misaligned teeth are also affecting your oral health? Crooked teeth are harder to keep clean, which puts you at a greater risk for gum disease and tooth decay. A misaligned bite can contribute to bruxism (teeth grinding), and jaw joint issues. Straightening your teeth not only improves your confidence, but also your oral health. If you’re ready to take the next step toward a beautiful, healthy smile, contact our office and schedule a consultation with Dr. McKnight, your dentist in Mesquite. He can determine if Invisalign is right for your needs with a thorough examination, x-rays and photos of your teeth. A dazzling smile is only a phone call away!